Fall is by far and away my favorite time of year. There is something magical about the crisp weather, a lit candle, a hot drink, and a blank page to write on. And here we are. It’s November! To be honest, most years I’m not yet ready for fall. The cooler weather will hit, and I will find myself standing at the entrance to a tunnel and I can see the new year coming down the track. But it will be moving too quickly for me and I find myself feeling unprepared and, honestly, a little bit anxious. Between Thanksgiving and Christmas, the holiday season is busy enough in its own right. My wife and I will taking our 3 boys on a road trip to Colorado for the former, and we already have quite a bit of plans for Christmastime. I can’t wait. But, in addition to the holidays and family time, November and December are the two biggest months of the year for Tools & Toys and The Sweet Setup. Over these next two months, our website traffic will be roughly 2-3 times that of any other month of the year. And we’re doing all we can to make the most of it. Between our annual Christmas Catalog post, guides, and some new products we are working on, there is a LOT going on. I share all this because you may feel in a similar situation. You’ve got several work-related projects (all of which are important). You’ve got some personal projects (all of which you really want to make progress on). You’ve got several books you want to read (all of which look awesome). And you want to spend as much time with your spouse and kids as possible (especially with the holidays coming up). You feel the tug of wanting to work on too many things at once and not knowing which to choose. This in and of itself can be stressful. It also can lead to procrastination and paralysis due to uncertainty and indecisiveness, which just compounds the issue even further. “How am I supposed to get all this done?” You’re asking. That is a great question. And you’re not the only one asking it. By far and away, one of the most common challenges I hear from people is their challenge of having too much to do. Too many spinning plates. Too many important tasks. Too many areas of responsibility. Sometimes, however, the overwhelming business of life is a sign that something is broken. If you’re feeling overwhelmed, ask yourself if it’s because you’re on the edge of doing something awesome or is it life showing you that something needs to be cut out? If the latter — you’re overwhelmed and you know something’s got to give — then do this: Take inventory of where you’re spending the bulk of your time and energy (not where you wish you were spending it, but where you’re actually spending it). Now ask yourself what can be subtracted to give your calendar, your mind, and your emotions some breathing room. If the former — if you’re on the edge of breakthrough in a project — then sometimes the answer is to keep working and just hold on and persevere for the season. But don’t persevere to the detriment your health and relationships. Don’t give up your healthy boundaries. When you’re in an intense and busy season, what’s important is to keep your sanity and health. This way you ensure that you are actually making progress every day and not just suffering under the weight of being busy. This will also help ensure that when the busy season is over, you don’t hit a wall and get sick or depressed. When life is at its busiest then it is that much more important to be overly diligent and intentional with how you spend your time and the boundaries you keep. Making sure my day is filled with intentional work. Step one is knowing what to do and having a plan of when I’m going to do it. This is so important, that I’ve actually been spending more time managing my time. The days can so quickly get away from me that I’m upping my intentionality to make sure my daily and weekly schedule is providing me with the time I need to do the most important work. Dialing back on “novel stimuli”. I love Twitter and Instagram. They are great places for conversations, dialog, and finding cool stuff. But it’s not where I do my aforementioned most important work. For me, this is just about the only “noisy and distracting area” of my life. I don’t read the news. I don’t have Facebook. And no longer keep tabs on hundreds of RSS feeds. So by having a healthy boundary around the amount of time I give to social media, I am able to maintain margin for other, more important things. Recognizing progress. This is huge. When you’re down in the thick of it, one of the best ways to keep your momentum going is to recognize and celebrate the progress you make each day. I use Day One because it’s awesome. And at the end of the day I’ll write down the small wins from my day. Health. This is the one that goes out the window the fastest for me. Which is unfortunate, because it’s also the one that matters the most. A good night sleep, a diet that gives you energy, and some regular out-and-about exercise is so good for you. I’ve actually begun doing yoga, and it’s been awesome. But there’s more to it than just another listicle of tips and tricks and hacks for being awesome. 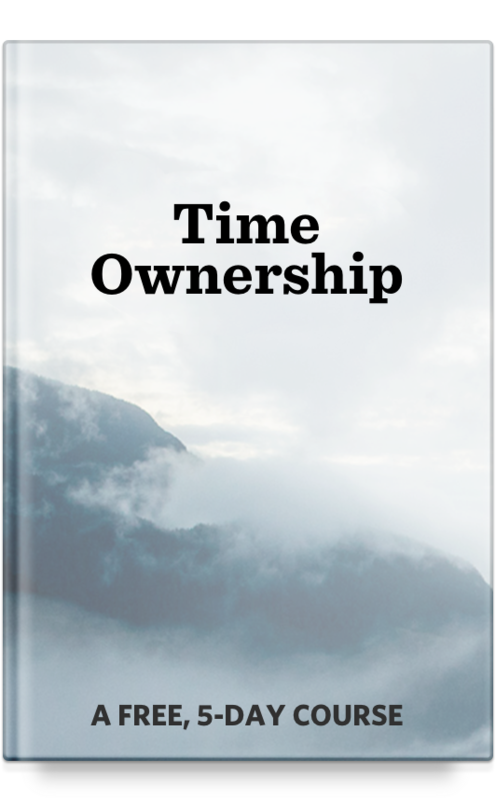 It ultimately comes down to taking ownership of your time and attention. If you regularly find that you’re not able to do your best work in this season of life, ask yourself whose fault that is. Sometimes things are outside of our control. But more often than not, there is something we can do about it. The person who is frustrated at how long it’s taking to write their book, yet is watching a few hours of television every day, may want to reconsider how they’re spending their evening. When you take ownership of your time and attention, everything changes. It’s not easy, but it’s worth it. And I would be remiss if I didn’t take a chance to mention just how helpful and powerful The Focus Course can be in this area. I designed the Focus Course to guide you along a simple path that starts out fun and easy and then builds into something resulting in deep and lasting change. The course enables you to experience deep satisfaction in work and in life by making meaningful progress every day to accomplish that which is most important. If you haven’t already, take our free Focus Quiz, and get your personalized assessment. It’s pretty awesome how it all works. And then, be on the lookout… On Tuesday, November 14, we will be opening up registration for the Focus Course. If what I’ve written about today hits home for you, but you don’t know where to start… then you’ll want to start here.